on display at the Museum of Biblical Art. Martin Luther said that snakes were once four-legged cuddly creatures of the field. It’s in the Works of Luther, should you wish to read his theory. This summer’s news that a fossil was identified as a “four-legged snake” has a number of Creationists cheering about palaeontology. The Bible tells them that after the talking snake tempted Eve with some seedy pomegranate, God cut off all the snake’s legs, leaving the reptile squirming on its belly. God also rearranged the snake’s DNA and all subsequent issues of snakes were similarly hoofless. Until this summer, fossil relics of four-legged snakes were in short supply. Well, actually, there weren’t any at all. This didn’t disturb most Creationists because they are comfortable believing the world began (on a Saturday night) just a few days before the pomegranate incident in the garden. Not much time to accumulate many four-legged snake fossils. Nevertheless, you can find websites full of glee for this new discovery. It proves God had created at least one four-legged snake before causing its appendages to detach. 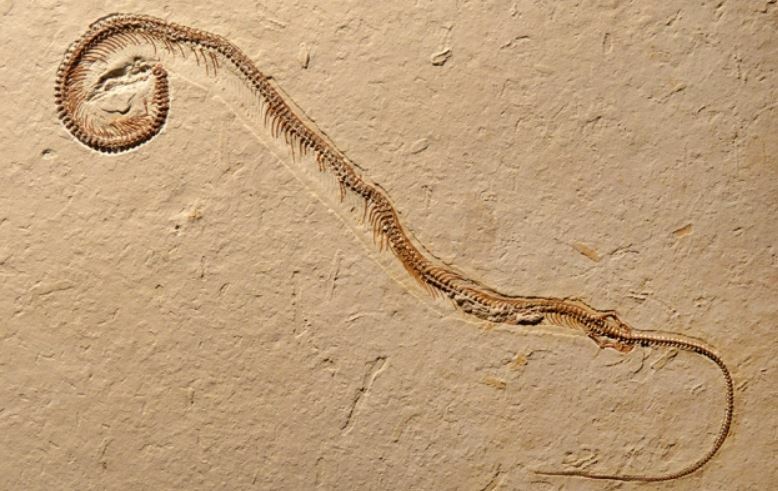 The real story of the fossilized Tetrapodophis, or four-legged snake, has legs of its own. David Martill, a British palaeobiologist, was leading a group of 3rd-year palaeontology students through a Berlin museum where Brazilian fossils were on view at a temporary display. Next to a placard labeled “Unknown” was the snake fossil. Professor Martill studied the rock for a moment: “I thought, ‘Bloody hell, it’s got back legs! '” Then he noticed the snake also had front legs. Martill is a respected expert on Brazilian Cretaceous fossils. He knew that a snake like this – with four legs – had never been seen before. especially in the image below. From Martill et al. (2015). This discovery is incredibly significant. Biologists expected that an evolutionary link might exist between lizards and snakes but until Martill’s accidental discovery, none had been found. Further, the creature has microscopic fossil bones in its stomach (indicating it was a carnivore), a bone assemblage that suggested it was a burrower, snakey scales (not lizardy scales), and, Martill thinks, the fossil is embedded in Aptian-age Cretaceous rock, making it nearly 120 million years old – much older than any other snake fossil. Unfortunately, the story is not so tidy. The fossil is an undocumented artifact. It was found on a museum shelf, part of a visiting display. Just in town from Brazil for a few days. No one is suspecting any funny business. It is what it is. (You can’t make these things in the basement.) Radioactive testing, microscopic examination, chemical analysis and CT scanning tell the truth. But it would have been darn nice to know exactly where it was dug up in Brazil, and what rocks were lying beside and below its discovery spot. Meanwhile, a few scientists are not so certain that the find is actually the modern snake’s ancestor. 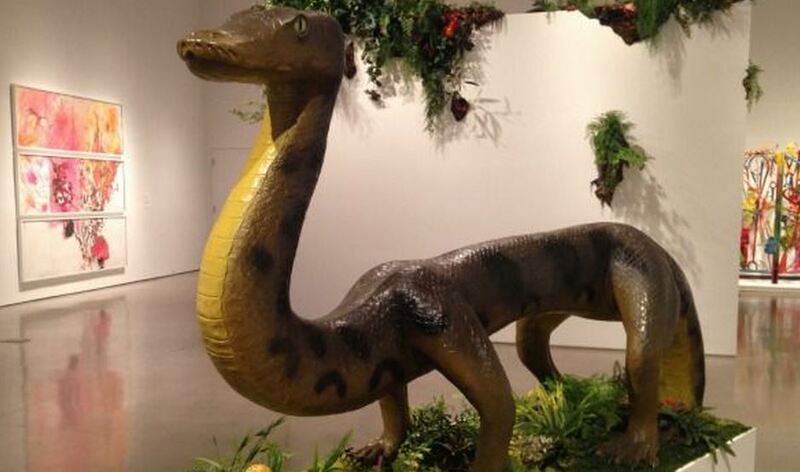 In particular, Dr Michael Caldwell at the University of Alberta thinks it looks more like a descendant of an even older, non-snake creature. The skull and spine don’t seem right for a snake ancestor, he says. And Caldwell should know, his research includes the evolutionary history of snakes and lizards. At the moment, he is cautious about the museum piece’s pedigree as the ancestor of all snakes, though he says it otherwise may have great importance as a long-lost lizard descendant. How are the faithful taking all this? I’ve noticed a dozen popular religious websites which seem to feel this vindicates traditional sermons that before the snake turned bad, it was a soft, friendly, meek and mild four-legged beast of the field. You can catch the good news at Shoebat’s: For The First Time Ever A Snake With Legs Has Been Discovered, Proving The Bible To Be True That The Serpent Originally Had Legs and the always reliable Answers in Genesis, which posted Did the Serpent Originally Have Legs? (Don’t bother feeding them click-credit – their answer (in Genesis, as they see it) is Yes. It’s in the Bible. Maybe you’re not overwhelmed by the wonderful Old Testament Bible story about fruits and snakes. Perhaps you find the New Testament more relevant. In that case, you will be delighted to learn that a virgin birth by a Missouri snake was also in the news this summer. After living alone for seven years she somehow managed to have little baby snakekins. No one knows how. But it does prove that virgin births are scientifically possible. If we want to prove the scientific validity of very old religions, we can’t forget the Okotoks Rock. Lying out on the flat prairie just south of my home here in Calgary is a mysterious big rock. The aboriginals called Big Rock Okotoks in their language. The rock is incredibly out of place, a boulder the size of a large 3-storey home sitting on wide-open farmland. Geologists claim that it’s an ice-age erratic. They think it was carried by a glacial train originating 500 kilometres north. They theorize that it was abandoned when the last prairie glacial ice melted. It has huge cracks caused by freeze-thaw cycles which have splintered the main boulder. But aboriginal legends tell a far more enchanting tale. The Creator god Napi had offered his robe to the rock but Napi took it back when the weather turned cold and the Creator had a chill. The rock chased Him, trying to get the robe back. Finally (and this part may be just a myth), a bird farted on the rock, knocking it from the sky, allowing Napi to escape. The rock shattered. Perhaps the story is true – scientific evidence is there for all to see: a huge out-of-place fractured rock, lying on the prairies. Does anyone really need any more proof than that to validate their belief? This entry was posted in Culture, Geology, Religion and tagged David Martill, four-legged snake, Garden of Eden, Michael Caldwell, Okotoks, young-Earth. Bookmark the permalink.